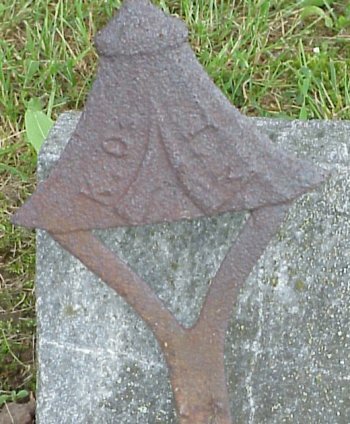 These four markers were found in Cortland and Broome Counties in New York State although organizations were known to be present inthe Tri-County area in Knoxville, Clymer, and Sabinsville in Tioga County PA. 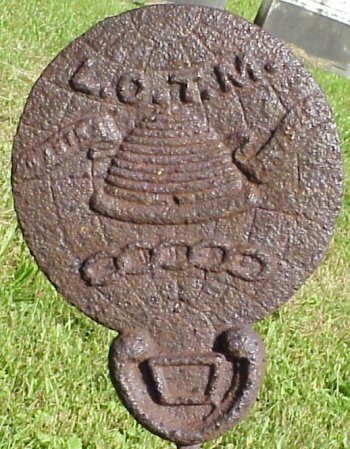 The symbol of the Knights of the Maccabee was the Tent and the symbol for the Ladies of the Maccabee was the Beehive. 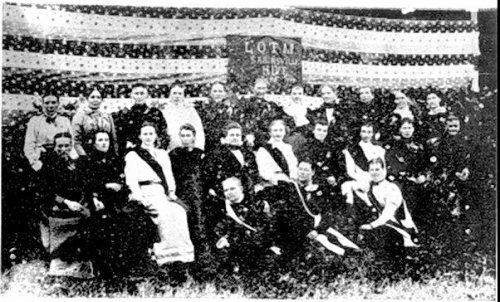 One Tri-County guest has a 1926 photo of a group of women labeled the Sabinsville Hive, L.O.T.M. The K.O.T.M and L.O.T.M. 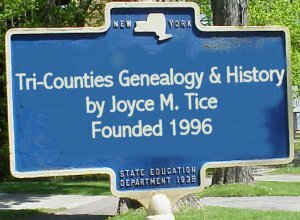 were listed as extinct organizations in the 1940s History of Clymer found elsewhere on my site.Since the original writing of this I have found Maccabee markers in several other counties of NYS and I have found a good history of the organization which I will summarize at the bottom of this page. All of these markers have the world globe as the background and either the tent or the beehive as an insignia. 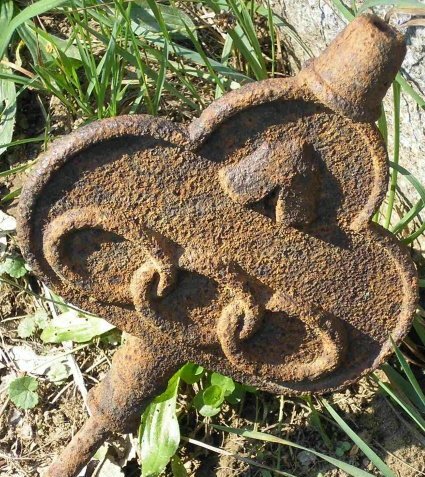 All are badly rusted but of a good heavy iron construction. I have found some newer ones of a galvanized metal that has not rusted, and all of these say just The Maccabees. I believe that the oldest one is the one with just the tent itself, followed by the separate KOTM and LOTM versions. The final version is the one that says The Maccabees that can be used for both branches of the organization. At its height the Ladies of the Maccabee had over 200,000 members and engaged in mutual benefit activites and charity. See the article on Before Welfare for additional information. Apparently the Ladies of the Maccabee was separate form the Knights of the Maccabee and not run as an "appendage" as many of the Auxiliarys are. What a great website! My brother in Michigan made me aware of it. I'm attaching a photo of a flagholder I photographed in Mt. Hope Cemetery in Lansing, Michigan. Are you familiar with it? Do you know what it stands for? 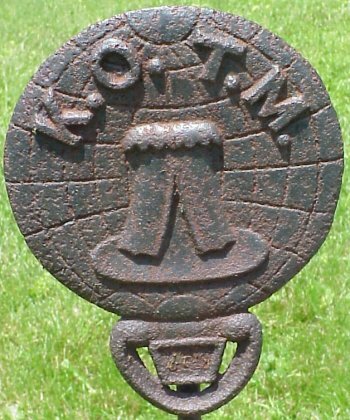 The Knights of the Maccabees of the World was founded in London, Ontario, Canada in 1878. The traditions of the order were from the history of the ancient Maccabeans whose leader had been Judas Maccabeus. This was a mutual benefit society the plan of which was for each member to contribute a dime to the widow of any deceased member. The limit on what any widow could receive was set at $1,000. Any contributions above this were put on deposit with the organization's treasurer. The first grand convention of this group was held in August 1878. By 1880 the membership had grown to the 10,000 that assured a widow her $1,000 limit on the death of her spouse who was a member. Internal strife led to a reorganizaiton in 1883 as the Supreme Tent, Knights of the Maccabees. 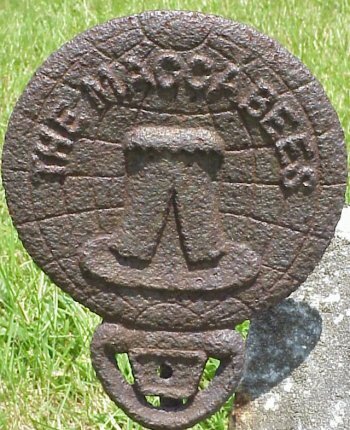 In 1914 the organization changed its name to The Maccabees. All of this fits with the dates on the tombstones by which I have found Maccabee flagholders. In 1915 the order had 331,756 members. In 1886 the idea of a women's group was developed and the women's group adopted its constitution in 1890. More internal strife led to the formation of the Ladies of the Modern Maccabees. In 1926, the original women's group merged with the men's group under the name of The Maccabees. In 1941 The Maccabees absorbed the Michigan Union Life Association and in 1937 it absorbed the Slavic Progressive Beneficial Union. The Maccabees was progressive in providing not only life insurance for widows and orphans, but also accident and sickness benefits to its members. In 1961 it became a mutual life insurance company. Although a mutual insurance firm, it retained the lodge system for members prior to the reorganizaiton. In 1978 its membership was 10,000, back to its 1880 level a century before. The history of the exclusively women's group is somewhat different. It is reported to be the first mutual benfit society managed by women at a time when women were prohibited by law and tradition from managing much more than their own kitchens. Their first several attempts at recognition by the Knights of the Maccabees were rejected, but in 1892 they created a national structure known as the Supreme Hive of the Ladies of the Maccabees of the World. Their 1892 schism resulted in the Ladies of the Modern Maccabees, presently operating as the north American Benefit Association. (See also the Women's Benefit Association which was an outgrowth of the Maccabees.) In spite of the schism of 1892, by 1915 the order had 179,716 members.